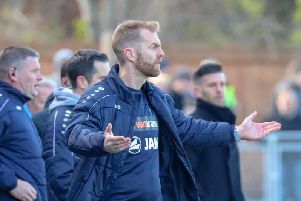 Harrogate Town manager Simon Weaver declared himself “pleased” with his side’s performance as they cruised to a 4-0 victory over Barnoldswick Town in the West Riding FA County Cup. Wayne Brooksby hit a hat-trick and Jordan Robertson also netted against the North West Counties Premier Division outfit, who play their football three levels below the men from the CNG Stadium. “The pace and tempo was very good throughout and we played some really nice football. I’m pleased with what I saw from the lads. Success for Town sets up a meeting with NCEL Division One side Campion in the next round.